Talisker distillery was founded in 1830 by Hugh and Kenneth MacAskil at Carbost, on the Isle of Skye. In all these years Talisker's distillation method has remained virtually unchanged, refusing to go with the flow of the industry, well...asides from the necessary health and safety improvements. As the only distillery on the Isle of Skye, Talisker's drams are quite idiosyncratic, defining an Island Malt style that is very much their own. Talisker 10YO is a true house representative that sticks to the distilleries definition of what their Single Malt should be all about. It just delivers that smoky soul from the beginning to the end. A wonderful expression that is just a great intro to what Talisker has to offer. 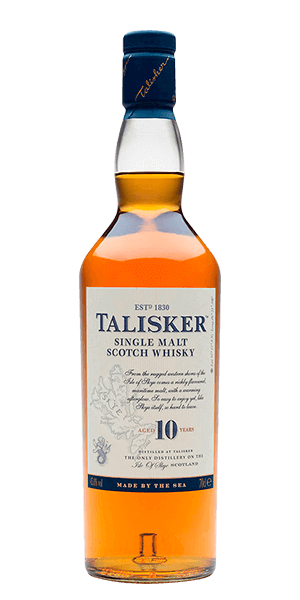 What does Talisker 10 Year Old taste like? The Flavor Spiral™ shows the most common flavors that you'll taste in Talisker 10 Year Old and gives you a chance to have a taste of it before actually tasting it. Apples, pears, dried grapes, heavier dose of smoke and spicy pepper. Peated smoke that lingers with a nod towards malted barley. For me this is a great balance of smoke and sweetness with a great spicy finish that lingers with the smoke. One of my new favorites. This scotch is extremely smooth with strong smoky flavor. Once the smoke and peat flavor fades you’re left with a mouthful of salty molasses. I'm a big fan of smokey tasting scotch whisky and this one doesn't disappoint in that regard. Really to smokey for my taste. This is my go-to bar stock for Islays. Its pretty mellow on the smoke and the salt gives it a very nice flavor. My wife knows to ensure a new bottle appears before the last one empties. There are some special edition Islays I would gladly drink before this, but for the cost, this is hard to beat. My first smoky scotch. Not my favorite at the moment, but quite good. Fun! Challenging, earthy and leathery flavors, but fun if you know what you're getting yourself into. Smoke is there too! My first introduction to scotch was Talisker 10 years and what a great intro it was. This was the drink that got me into whisky and will always have a special place on my shelf. The right amount of roughness to help warm you up on a cold day. Very smokey. More medicinal on the nose. Leather and polish. Some lime and lemon on the palette. Some honey on the finish. Not for me, taste like iodine. Nice smoke with more sweet than the Skye. Also peppery like Skye with the aftertaste of salt. Some discredit this bottle as too loud and unbalanced, but I think it's strengths make up for that unruly volcanic nature. No spirit I've ever tried has as much body in the mouth; it is like it expanding into your whole mouth. The flavor is of course that intense peaty marine flavor with a bit of black pepper. Unforgettable. A distinctive malt, with brine competing for your attention as much as smoke. Thoroughly enjoyable. Nose: Peat Smoke Phenols, Sea Salt, Iodine, Seaweed, Malt Barley Taste: Smoke, Sea Salt, White Pepper, Chilli Pepper, Slight Fruity Cask Influences of mostly Mediterranean Dried Fruits Finish: Medium to Long An extraordinary complexity for its age. Young age gives strength and peaty flavours. Tough and robust. Balanced. Almost a masterpiece. However its sharp edged flavours are not for everyone. Absolutely loved it, very smoke yet extremely smooth! My introduction to peaty whiskey. Definitely deep and complex. Harsh, but with enough flavor to back it up. Liked the nose But the finish was a bit harsh. A little smoke but lots of rich flavor. Strong initial bite but rich and deep flavor. Pairs well with red meat. Smoky on the nose, salted peat to the palate and rich sweet finish. I know some long time scotch drinks that will swear by Talisker but for me the smoke just killed the enjoyment. It was like drinking a camp fire. As a fan of smoky whisky, I found this one very enjoyable. Smoky and peaty with a mildly sweet finish. Excellent. My all-time favorite, always. The top of the hill above the distillery is all peat bog (and a beautiful view! ), so the dilute water adds an extra hit of peat. Talisker is my go to scotch. Such an amazing blend of smoke and peat and an essence of salt water. If you enjoy gargling with salt water and charcoal, Talisker is the Scotch for you and you can have it. I like it less than Lagavulin and that is saying something. This is my second bottle. From the first sip I was sold. The smokiness is the best I have tasted. Plan on enjoying it best when "Outlander" begins in September. Really great scotch that I enjoyed as a scotch novice. Love the peat and it reminds me to sip and enjoy. Love the smokey smoothness of this dram. I would buy it again and again. I recommend this dram with a little water or an ice cube. Smokey and sublime. Not quite the impact of Lagavulin but delicious nonetheless. Liquid ash! In a good way. I love this scotch. Salty, peaty, and oh so good! Plus the Bond tie-in makes an even more tempting buy. Bond fan or not, this scotch is great! Honestly, one of the best scotch whiskeys I have ever tasted. The perfect balance of smokey, spicy, and sweet notes in one dram. My favourite. Nicely balanced with a great flavour. Wonderfully unique with a nice complexity for a 10 year. Very smooth. Although I did enjoy the port ruighe much more. Has a sweet taste, followed by smoke, and then a little salt. It lingers for a while as well leaving a nice peaty taste. Smoky, salty, wow a great one! If you're looking for a peaty and smokey scotch with a touch of sweetness this is it! One of my favorites, smoke and sea with a long finish. Perfect! Хороший сбалансированный вкус. Копчёностей в меру. Богатое послевкусие. The 10 can be a bit hot for some, but I'm in love! If you're big into Scotch this is one to put on your list. Classic old school whisky. Big and bold. Agent 007's favorite dram. A great one indeed. For me this is the archetype of the pepper flavor. Rough like Sea... In a good way. Smokey , peat , sweet , perfect! By the sea. Salt smoke spice and fruit.